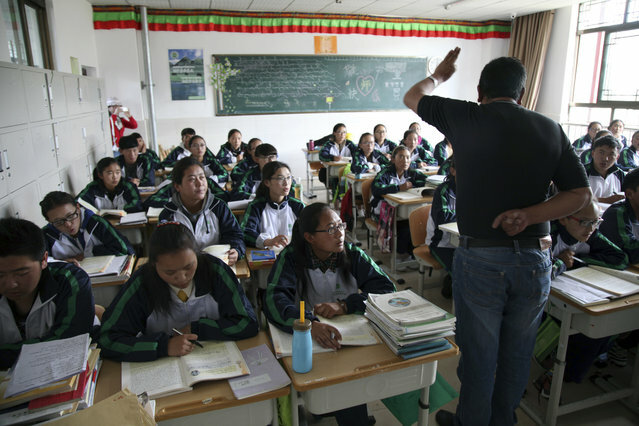 (TibetanReview.net, Apr22, 2016) – China is to send some 700 Chinese teachers to “improve” the quality of education at 20 schools in the Tibet Autonomous Region where the mother tongue is now taught only as a language subject in the primary school level, with Chinese being the medium of teaching throughout. The first group of 76 teachers had already arrived to take up positions in the regional capital of Lhasa, and in more remote areas such as Xigaze (Tibetan: Shigatse), Nyingchi (Nyingtri), Shannan (Lhokha) and Qamdo (Chamdo) under the programme which is for three years, reported China’s official Xinhua news agency Apr 20. There was no suggestion that any of the 700 Chinese teachers were required to be able to speak or understand Tibetan. The report said the programme was being sponsored by the ministries of education, finance, human resources, and social security, suggesting that it is part of implementation of a series of China’s work forum meeting decisions taken over the decades to ensure the region’s leapfrog development with the aim to counter local aspirations for preserving the Tibetan ethnic and cultural identity. The report cited Fang Lingmin, vice chairman of the regional government, as saying the teachers, who will be from 17 municipalities and provinces, including Beijing and Jiangsu Province, will be divided into 20 groups to assist teaching in the Tibetan schools. Under the same programme, China will select 400 teachers from Tibetan kindergartens and schools every year to receive training and hands-on experiences in schools in China, the report added. The report said the new initiative aimed to concentrate the efforts in the 20 designated schools in order to make real changes. The report said the region had 1,855 schools and more than 600,000 students, with enrolment rate in the primary, junior high and high schools being at 98 percent, 96 percent and 74 percent, respectively. The current programme is in addition to the one which has been in force since 1985, under which tens of thousands of bright Tibetan children are sent to schools in 21 provinces and cities across China for their further schooling and higher level or vocational education.